I revised my “about” page. I decided to also use it as my current post. You see when I first started this blog, I didn’t know what exactly to write for my “about”. I did a simple, neat and elusive paragraph. I had wanted to stay very anonymous. I thought I wouldn’t use names, I wouldn’t post pictures of my daughter, I would keep it very ….distant. I am not a computer, technology, social media type of person. And, to be quite frank, it scares me. Well now that we’ve been blogging a while, I realize that no one is really looking at my blog anyways. That is somehow liberating. I had grandiose ideas of followers and …dare I say, book deals….! Ok, so. Anyways. What I have found is that my daughter and I are having tons of fun with this blog, finding a creative outlet that satisfies us, gets us thinking, helps us (particularly me) feel more gratitude for what we have and the adventures we are blessed to live everyday. I have made some online connections with other “horsey” addicts, homeschoolers and homesteaders which I have learned so much from and enjoy keeping up with. Other than that, I still feel we have that anonymity that allows for more sharing. Thus, I have been using pictures of a more personal nature, as well as more honest thoughts and writings. I finally decided to add a more honest bio to my about page and I share that here now. Welcome to Barnraised. This is about life in all it’s messiness and all it’s beauty. I moved my family into a barn, literally. It all started with a horse, then became more. We moved into the barn apartment of the boarding and training facility where I initially kept my horse. Our lives have completely changed. This blog follows the fun, the adventure, the beauty and-yes-the messiness and challenges all along the way. Thanks for stopping by the barn! My bio: I have an undergrad degree in Social Work and a masters degree in Counseling. I spent many years working with children and families in different social work and therapeutic situations. I have lived and worked all over the world, specifically in Japan, Ireland and England as well, of course, as many states in the U.S. I then “settled down”, married a good (and -thankfully- very flexible, easy-going and low-maintenance) man, got my contractor’s license and started a construction-type business with him, then had a little girl (Sahalie) that made life so much more exciting. She is seven (at the time of this “about” page). I left my career in social work and therapy to focus on our business and homeschool my girl. I found the world of Waldorf education and have studied, studied, studied. I homeschool in the Waldorf pedagogy and we love it. It’s magical. I ultimately earned a certification in Waldorf Education. Just FYI, we use a combo of the Christopherus homeschool curriculum and un-schooling. Prior to all of this, I have been a waitress, bartender, teacher, traveler, librarian, nanny, basically-you name it, I’ve probably done a little bit of it. I grew up with horses and showing, but left that world during my years of college, travel and career. Then I found it again (through my daughter who loves horses). I rediscovered my love of horses, of the barn life and simplicity. My daughter and I bonded deeply through horses and riding together. We bought one horse, we got a second, I became a certified horse trainer and riding instructor through the Certified Horsemanship Association (CHA), started instructing at our local commercial boarding, touristy trail-riding, riding lessons and training facility (where I boarded our horses). Everything snowballed from there and I was offered the opportunity to move into the barn apartment and oversee the place (50+ horses). This would be a lot of work AND a lot of fun. What an experience. So, we moved in and it’s been a whirlwind of learning, growing and inspiration ever since. I have always known the therapeutic value of a horse, how they teach us about ourselves and force us to grow. I never would have foreseen this path in my life opening up. I truly feel like I stepped into my purpose in life as I teach therapeutic horseback riding to children (and some adults) with a passion I never knew I could feel for my life’s work. It is one of those “Cinderella stories” where the shoe just fit, my two “worlds” collided and I just belong here. While it might all sound like a fairy tale, I assure you it is not. It is a constant paradox of peace, quiet, acres of horses, nature and being in the moment, a wonderful escape from the rat-race AND it is also hectic, busy, sometimes very loud with never ending work, early mornings, little sleep. It is one moment breathing fresh air and enjoying a quiet sunrise and then the next moment of 9 degree morning feedings in three layers of clothes, breaking ice in water troughs, getting out a trail ride of five dude riders (God help us), checking on a colicing (sick) horse, calling the vet, arranging a riding lesson, sweeping up spilled grain and wishing everyone would just go home! When I started this blog, I was torn between writing about…Horses? Homeschooling? Parenting? 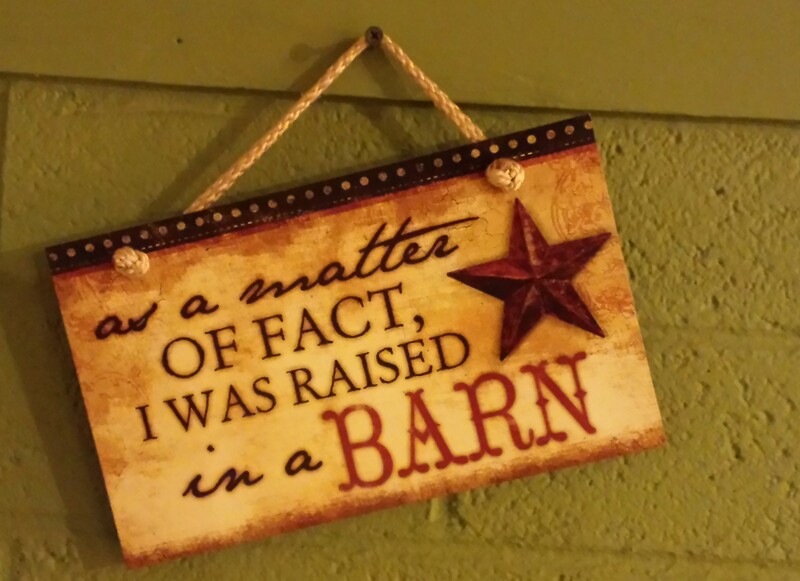 Life living in a barn? Rambling thoughts? I just let it flow and found myself going back and forth between subjects sort of weaving it all together. This is my place to explore life, relate horses to philosophical thoughts, remind myself of what’s important and have a creative outlet for my daughter and myself to create an “online journal” about our adventures here, as she is always my editor. She and I both take the photos and come up with the ideas. Her artwork and inspiration is included here as well. This blog is continually trying to improve and grow (as am I) so I appreciate any and all thoughts, comments, suggestions and connections. Thanks again! Found the issue online but no way to click open and read articles. Where could I find it on your blog? I replied earlier but it looks like it got lost? Sorry if you get two replies! Anyways, thanks so much for the link. Very interesting article! I love hearing the perspective of someone whose children are grown and how you feel looking back on homeschooling. It is very reassuring! I also appreciate the honesty of how you struggled at first with the decision to homeschool but then how, after time, you found a rhythm. I also use a curriculum and find that it’s more of a “safety net” too. I feel better having it to look at and guide. But then, the more comfortable I get with homeschooling, the more I find myself branching off away from the curriculum too. Thank you so much for sharing this with me!! I enjoyed the bio. You’ve made and are making an interesting life. We homeschooled our children too. Our son chose to go to regular school for high school (we joke that he was expelled from homeschool), but we homeschooled our daughter all the way through high school. She went on to college and is now a vet tech, doing what she loves. Homeschooling isn’t for everyone, but for those who have the right combination of kids and parents it’s a great way to help children educate themselves. I love hearing homeschooling perspectives from those that have been there and done it and can share how it turned out in the “end”. So happy to hear your story! So far, I think she and I have the right combination for it to work. I do get anxious thinking about the older years…especially high school. But you remind me there’s hope 🙂 Thank you! Loved learning a little more about you, I had no idea you were a homeschooler, and a Waldorf one at that. But I am new around here, so forgive me. It’s funny as you think about updating your about page, I am thinking about a name change for my blog. Things ebb and flow in the blog world, and I love that it gives us the space and freedom to recreate our spaces. I love the name of your blog as is… but curious to see if and what you change it to. Enjoy your weekend too! I too am happy to learn more about you. Thank you for your openness and for (continually) sharing your unique story!